Synaptic transmission is the process whereby one neuron (nerve cell) communicates with other neurons or effectors , such as a muscle cell, at a synapse. A typical neuron has a cell body (soma), branching processes specialized to receive incoming signals (dendrites), and a single process (axon) that carries electrical signals away from the neuron toward other neurons or effectors. Electrical signals carried by axons are action potentials . Axons often have thousands of terminal branches, each ending as a bulbous enlargement, the synaptic knob or synaptic terminal. At the synaptic knob, the action potential is converted into a chemical message which, in turn, interacts with the recipient neuron or effector. This process is synaptic transmission. Synapses are junctional complexes between presynaptic membranes (synaptic knobs) and postsynaptic membranes (receptor surfaces of recipient neurons or effectors). The prefixes "pre-" and "post-" reflect the direction of synaptic transmission: presynaptic is the transmitting side (synaptic knob) and postsynaptic is the receiving side (dendrite, soma, or effector). Synaptic knobs contain many membrane-bounded synaptic vesicles , 40 to 100 nanometers in diameter. Synaptic vesicles contain the neurotransmitter. Synaptic knobs also contain mitochondria , microtubules, and other organelles . Synapses are named according to their location on the postsynaptic neuron: Axospinous synapses are synapses on dendritic spines (tiny projections on the dendrites), axodendritic synapses are on shafts of dendrites, axosomatic synapses are on the soma of neurons, and axoaxonal synapses are synapses on other synaptic knobs. Synapses on skeletal muscle cells are neuromuscular junctions. Action potentials arriving at synaptic knobs trigger the release of neurotransmitter into the synaptic cleft. The molecular mechanism is not completely understood. A "synaptic delay" of one to two milliseconds occurs between the arrival of the action potential and the neurotransmitter release. Action potentials open calcium channels in the membrane of the synaptic knob, which causes an inward movement of calcium ions . Calcium ions trigger the release of neurotransmitter from synaptic vesicles into the synaptic cleft. The synaptic vesicles fuse with the presynaptic membrane during this process of exocytosis. The membranes of old vesicles become part of the presynaptic membrane and new vesicles pinch off from an adjacent area of membrane. These new vesicles are subsequently refilled with newly synthesized or "recycled" neurotransmitters . Released neurotransmitters diffuse across the narrow synaptic cleft. At the postsynaptic membrane, neurotransmitter molecules bind to membrane-bound receptor molecules with recognition sites specific for that neurotransmitter. Binding of the neurotransmitter to the receptor triggers a postsynaptic response specific for that receptor. These responses can be either excitatory or inhibitory, depending on the properties of the receptor. If receptor stimulation results in the postsynaptic membrane becoming more electrically positive (depolarized), it is an excitatory postsynaptic potential (EPSP). If more negative (hyperpolarized), it is an inhibitory postsynaptic potential (IPSP). Excitation and inhibition depend on the properties of the receptor and not the neurotransmitter. Receptors coupled to sodium or calcium channels are excitatory and produce a depolarization of the postsynaptic membrane, whereas receptors coupled to chloride or potassium channels are inhibitory and produce a hyperpolarization of the postsynaptic membrane. Such receptors coupled to ion channels are called ionotropic receptors. Synapses are junctional complexes between the presynaptic neuron and the postsynaptic neuron. 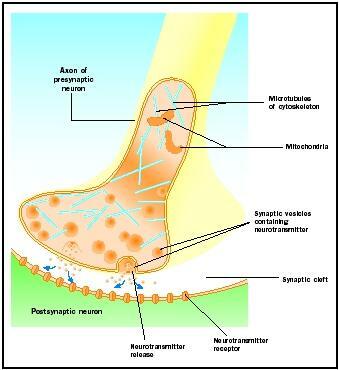 Presynaptic is the transmitting side of the nerve impulse and postsynaptic is the receiving side. postsynaptic events. These range from the direct activation of adjacent ion channels, to alteration of receptor sensitivity, to transcription of specific messenger ribonucleic acids (RNAs), or even the activation of specific genes . Chemical synapses are part of a very adaptable and flexible communications system. These are not static anatomical structures with fixed properties but are dynamic structures, able to change their molecular properties with changing circumstances. There are literally hundreds of neurotransmitters. Some are fairly simple compounds such as acetylcholine, serotonin, the catecholamines (dopamine, norepinephrine, and epinephrine) and a number of the amino acids . Many are more complex and belong to the vast array of neuropeptide transmitters. Once released into the synaptic cleft, neurotransmitters remain active until they are either altered chemically or taken back into the synaptic knob by special carrier systems and recycled. At cholinergic synapses, acetylcholinesterase is present in the synaptic cleft. This enzyme cleaves the neurotransmitter into acetate and choline, neither of which is active. Serotonin and epinephrine, on the other hand, are taken up into the presynaptic terminal and recycled. Electrical synapses, although rare in vertebrate nervous systems, do exist. In an electrical synapse, or gap junction, the presynaptic and postsynaptic membranes are partially fused. This allows the action potential to cross from the membrane of one neuron to the next without the intervention of a neurotransmitter. Electrical synapses often lack the directional specificity of chemical synapses and may transmit a signal in either direction. During biological activity, electrical synapses do not have the potential for as much variation as do chemical synapses. Burt, Alvin M. "Histology and Fine Structure of Nervous Tissue," "Neuronal Communication," and "Chemical Transmission." In Textbook of Neuroanatomy. Philadelphia, PA: W. B. Saunders, Co., 1993. Saladin, Kenneth S. "Nervous Tissue." In Anatomy and Physiology: The Unity of Form and Function. New York: McGraw-Hill, 2001. German-born American physician who received, with Henry Dale, the 1936 Nobel Prize in physiology for the discovery of a substance that stimulates nerve cells. In the 1920s, Loewi provided the first evidence that chemicals transmit impulses between nerves and organs, such as the heart. I love this,thanks so much,it is instresting,i already passed my exams with dis.